see... it's not so big. Wait. The hopper is huge in the side-by-side comparison to the Enterprise, so does that mean that the alien is like 30 feet tall or something? I knew someone was going to ask that question, and curiously enough I think I knew that someone would be you, Chris, but the Space Hopper is not that big. It only looks big in comparison to the Enterprise because it is closer to us. It's all a matter of perspective... forced perspective. And "no", the alien is not 30 feet tall, although it may be a whimsical idea to have an alien that appears small on the view screen, but turns out to be a giant; it wouldn't be much of a tour of the Enterprise if he couldn't leave the hangar bay. Chris-Tar. Thank you for that artistic advice, I'm always open to suggestions from readers and fellow artists. 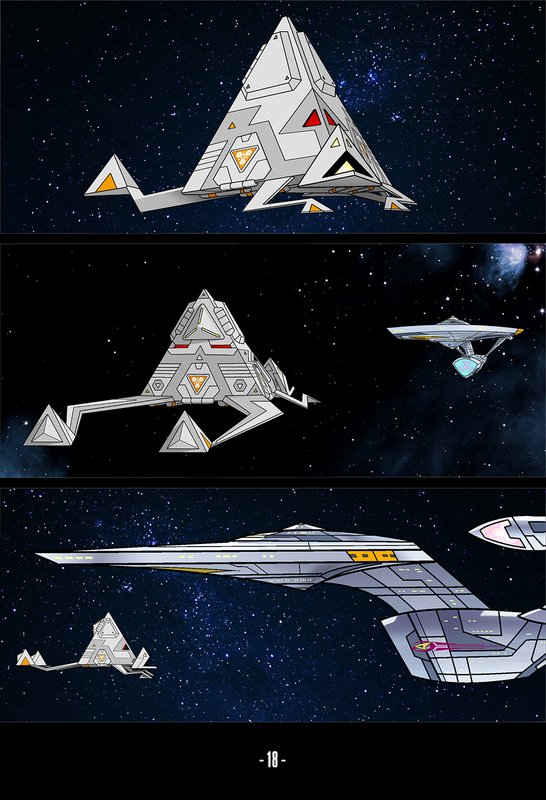 But keep in mind I'm reproducing the look of the Star Trek Animated Series, and they did not have any of the atmospheric blurring or less contrast that you describe, and I really wanted to keep both vessels sharp for better visibility. I put a lot of work into those drawings, I want to show them clearly! Let's hope the Space Hopper has a docking port. Fitting it into the shuttle bay may be... difficult. Speaking of sizes...how does the G compare in size to the classic Enterprises? A very good question, Steev, thank you for asking that. The Enterprise-G is based on the classic Constitution Class Enterprise from the original series and the re-fitted version of The Motion Picture, but it is slightly larger.